In Autumn of 2005, around the same time as the nation-wide celebration of Guy Fawkes day, we set out to experiment with fireworks – thinking about the basic components to turn an individual or passive event into a community one. We thought about how to make rules for that to happen, what the setting would require, how it could take different forms. It was an early experiment in an attempt to better understand some basics of participatory practice. We came up with some basic game principles, invited around 15 friends and colleagues and set about playing for several hours along Shoreditch canal, London. People with sparklers can act as an extended ‘fuse’. People with sparklers along a 200m stretch of the canal were the long distance ‘fuse’ leading to a person at the end holding a roman candle. We lit the sparkler of the first person in line. The challenge for each person was to reach the next person in line before their sparkler ran out, and to finally ignite the roman candle. 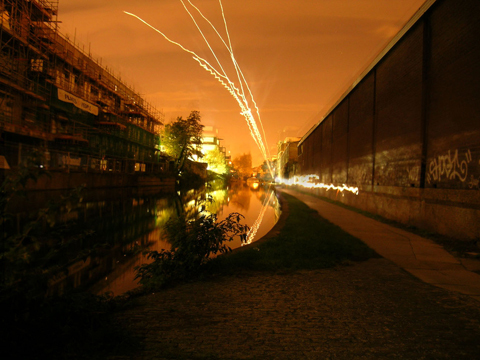 People with sparklers along a 200m stretch of the canal were the long distance ‘fuse’. The first person in line had their sparkler lit. Each person had the duration of their sparkler to complete a section of the drawing before their sparkler ran out. All drawings were connected sparkler to sparkler, to create a final landscape. People with sparklers wrote their own secret messages, only captured on camera. Participants were split into groups of 5. Each group was given one roman candle; plus one sparkler for each other member of the group. All teams had one sparkler lit at the same time. The sparklers needed to act as a person to person fuse, lasting as long as possible until, when the last sparkler was almost out, they lit their roman candle and gave away their position. The challenge for each group was to get as far as they could in one direction while keeping the sparkler fuse chain alive. The last group to give up their position wins. Participants were split into groups. Groups were given one sparkler for each member of the group. All teams had one sparkler lit at the same time. The groups set out to hunt for and find fireworks hidden within a set perimeter. Sparklers acted as a person to person fuse, lasting as long as possible while hunting for fireworks to light. The challenge for each group was to light as many fireworks as possible before the last sparkler of the group extinguished. The group who found and lit the most fireworks wins.